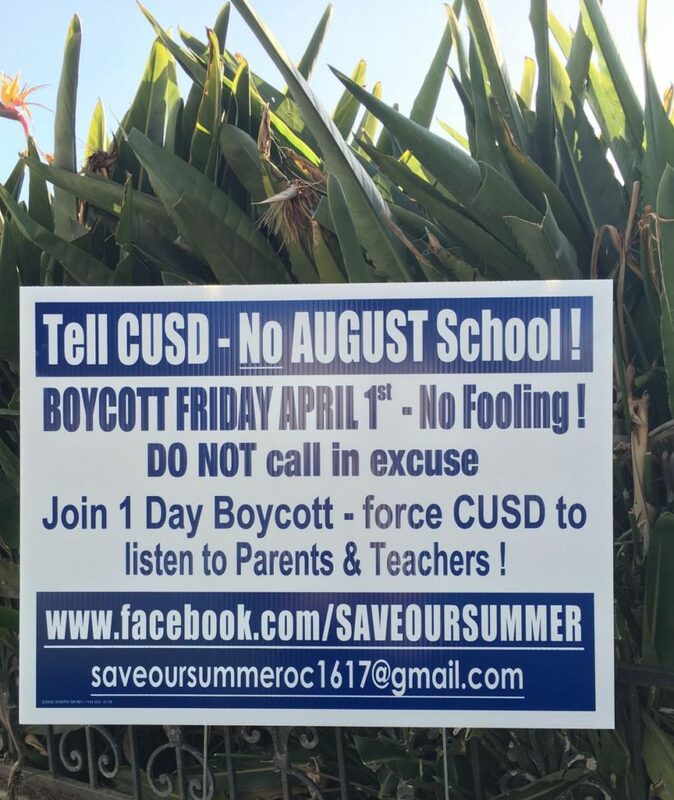 Sign advocates one-day school boycott over Capistrano Unified School District's decisions to begin classes in August. (by Fred Swegles, OC Register) — A group of parents in South County planned a student boycott of Capistrano Unified School District campuses on Friday, protesting district decisions to start the school year before Labor Day. “Boycott Friday, April 1st! This is no joke!” says a flyer that parents were circulating Wednesday via e-mail and a “Save Our Summer” Facebook page. Members of the group said they hope to get the district’s attention and force a new dialogue, feeling that the district didn’t adequately seek feedback before making the change and then granted only token parent participation after a backlash. A district spokesman didn’t return phone calls and emails seeking comment Wednesday afternoon. CUSD historically has begun classes in September, after Labor Day. A year ago, the school board adopted calendars for two school years, opening school on Aug. 22 for last fall’s term and projecting an Aug. 15 start for the coming school year. District officials said the change aligns CUSD with the vast majority of districts in Orange County, with the CIF sports calendar and with Saddleback Community College. It also gives Advanced Placement students more time to prepare for exams and eases AP students’ transition into colleges, officials said. Parents protested the change, gathering more than 3,000 signatures on a Facebook petition, but trustees reaffirmed the Aug. 15, 2016, start date at a board meeting in October. Protesting parents said that families plan beach vacations or beach time for the heat of August and don’t buy the district’s argument that AP scores will rise if students get an earlier start. CUSD has been one of California’s highest-performing large districts, even before making the change, Workman said. Laguna Niguel parent Carrie Cook said AP scores were never an issue before, and her kids, AP students, do well. Reprinted here for educational purposes only. May not be reproduced on other websites without permission from The Orange County Register. For the original article, visit ocregister .com. 1. Why did a group of parents in a California school district call for a one-day student boycott of classes? 2. What did the parents hope to achieve by staging a one-day boycott? b) How did district officials explain their reason for the changes? 4. How did the parents quoted in the article explain their reasons for protesting? Be specific. 5. For what reason do you think the district spokesman didn’t return phone calls and emails from the reporter seeking comment on the issue? 6. a) If the majority of parents want the school start date to stay the way it has always been, should the school district be able to change it for the reasons they have stated? With whom do you agree? Explain your answer. Capistrano Unified School District (CUSD) is the second largest school district in Orange County, California, the 8th largest in California and the 78th largest in the U.S.. The District currently has 54,036 students and administers 33 elementary schools, 2 K-8 schools, 10 middle schools, 6 comprehensive high schools, 5 charter schools, and multiple alternative education programs. The Capistrano Unified School District has a seven-member board of trustees, with each trustee representing one of seven geographic areas within the school district. Each trustee is elected to a four-year term of office. Trustees must reside in the area they represent. The board of trustees is the policymaking body for the school district. It is charged with providing a quality educational program for students in grades Kindergarten through 12 in accordance with the California Constitution, the laws of the state, adopted board policies, and the desires of the community. As elected officials, trustees are state officers responsible for the governance of a political subdivision of the state. The school district is independent of city and county governments, but cooperates with them.